Maxum 41 SCR, a beautiful yacht with great exterior and amazing interior. We did custom mattress and bedding for this customer. Our mattresses are all about giving our clients a good night sleep. We make everything custom to fit the size and shape of your particular bed. 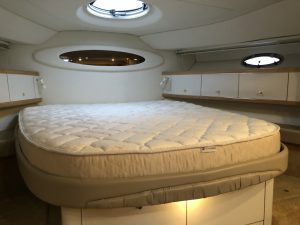 We can make any material, any size and shape you desire but we always recommend Latex to our clients when it comes to mattresses and toppers for your boat. Latex is definitely a wise choice when it comes to marine environment. It is 100 percent mold and mildew resistant, extremely comfortable, bendable, breathable, regulates body heat so you sleep cooler than warmer and doesn’t absorb smell. Our 7-inch Commodore and 9-inch Admiral are one of the most popular among our clients. You can view the details on our website under mattresses. For this client, we did our 6-inch Hybrid mattress. It is an economical way to enjoy the comfort of Latex and freshen up your stateroom. We start with a 3” base of hi density polyurethane foam and add 2 inches of soft latex and cover it in our plush bamboo quilting. With several boat mattress and mattress topper options to choose from, we are able to create a sleeping solution to fit all budgets. 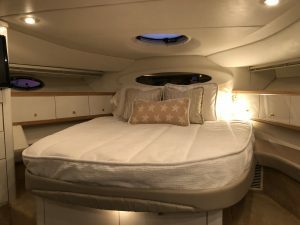 For the bedding for this beautiful boat, designer came up with a very neutral and elegant collection. Our Gridlock fabric for the custom coverlet and shams, a slight addition of sparkle and elegance at the same time by throwing the pillows in our Champagne fabric and finishing up the entire look by fun beige star lumbar pillow. Our coverlets fit the size of your bed, are quilted with a medium weight batting, have a piping trim edge and a drop to give a beautiful custom look. You can choose any fabric from our fabric collection to order bedding for your boat. Our house fabrics can be viewed on our website and feel free to send us a request and will be happy to send a swatch your way. We also carry Sunbrella Collection and an entire line of Sferra Linens. Email us or call at our show room if you have any questions regarding our products and our design team will be more than happy to assist you in transforming your stateroom into a STATEMENT ROOM.